The basis of your star card is a simple Froebel star. This technique can be used to make a 3D star, but for this project we’ll be making flat ones. We recommend using paper of roughly 110 gsm. 1. Fold two strips of paper in half and hang one over the other at a 90˚ angle (a). Then hang a third strip over the second strip in the same way (b). 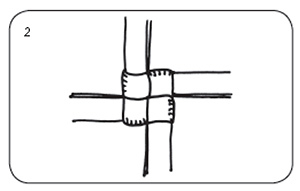 Next, hang a fourth strip over the third strip and weave it inside the first strip (c). 2. Carefully pull the strips until they fit snugly together. 3. Turn the woven work over. 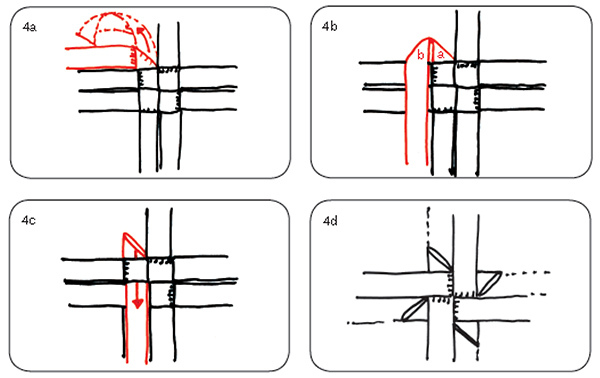 Then, using the uppermost strips only: fold from bottom to top (a); from left to right (b); from top to bottom (c); and finally from right to left, threading this final strip through the loop created by the first strip (d). Pull to fit snugly again (e). a (b) and tucking it into the top left square (c). It’s easier to do this if you hold the point back slightly. Make the other three points in the same way, turn over and repeat on the other side. This makes a flat star without 3D points (d). Using combinations of stars of different sizes and strips of different coloured paper, there is no end to the number of beautiful Christmas card designs you can create. 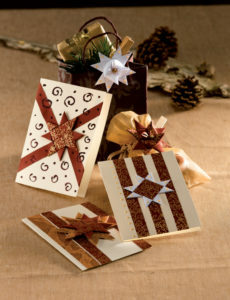 In the examples in the photo, 1.5cm wide strips of paper have been used to make the stars, with 2cm wide strips used to make the larger star on the bottom card. You can experiment with different widths to create stars in different sizes. We’d love to see your amazing creations! Tag us @FlorisBooks on Twitter, Instagram and Facebook using #BeautifulPaperStars – we’ll repost the best ones. 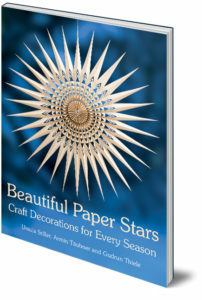 Create a sparkling universe of stars with paper and imagination with Beautiful Paper Stars! From glowing lightshades and spring garlands to glittering Christmas wreaths and tree ornaments, making paper stars will brighten your home in every season. The book includes six different traditional methods of star-making – including folding, cutting or weaving – to create a world of stunning star variations. Each of the forty projects is illustrated with step-by-step instructions and graded for difficulty to allow you to progress confidently.